This entry was posted on October 1, 2015 at 4:29 pm and is filed under Biography, Drama, Sports with tags 2015. You can follow any responses to this entry through the RSS 2.0 feed. You can leave a response, or trackback from your own site. Oh goody, more opportunities arise for Tobey Maguire to demonstrate that comical scream-face. I think I’ve seen trailers and there looks like there’s a bit where he’s initially just talking in a calm voice with someone who’s either not there or their back is turned to us (i can’t recall right now which is the case), and then suddenly he just. . .yeah. Goes and does that. He’s completely unhinged in this. It’s not bad. It’s just not that good either. Thanks for your review. I really want to see this! 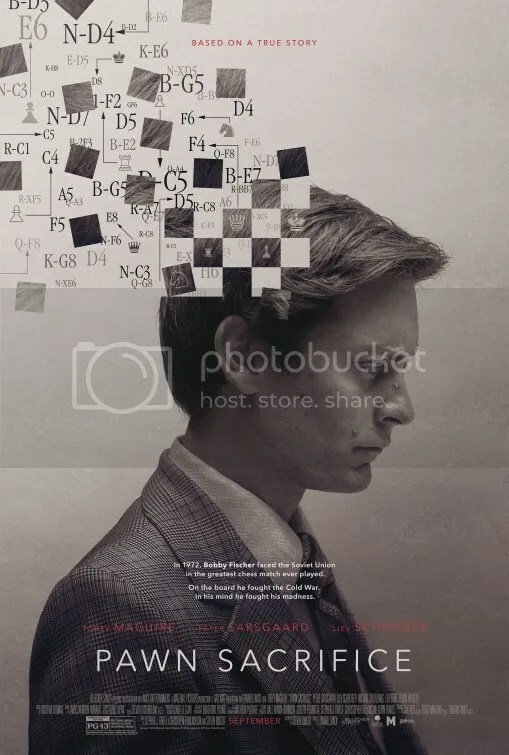 I hadn’t heard anything about Pawn Sacrifice, so I’m impressed to learn that it’s a “handsomely mounted period piece” with “shifting cinematography styles.” I must admit though, I am disappointed to hear that it doesn’t dig into chess as a game, instead focusing on Fischer’s state of mind. I love chess (I’m not good at it), but I would be excited to watch high stakes matches play out on screen. I’m also bummed to hear that Fischer is such an unlikeable character/individual. I agree that you don’t need to necessarily like the main character to appreciate a film, although I think you need some element of humanity that makes him relatable despite his flaws. Sounds like that was completely missing.